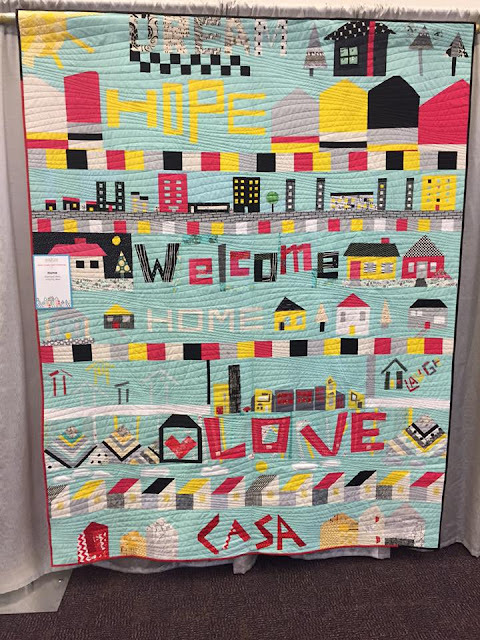 Although I was unable to attend Quiltcon 2016, part of me was there in a wonderful charity quilt from a group that was organized completely online! Gotta LOVE the internet! +Pat Sloan asked me if I would be interested in participating in a group of independent MQG members to create a quilt along with Elaine Schmidt, Tara Celeste, Rebecca Lavash, Ivete Tecedor, Katie Kasel, Lorraine Lucas, Monica Turbyfill and Wanda Ann Dotson. The group met through an online chat to work out all of the details of what, who, how and YAY we are doing this together! It would be a quilt based on improv houses. It was decided that the quilt will be presented to a family that will be moving into a Habitat for Humanity House through South County Habitat for Humanity. Home is where the heart is and where love grows! My row was a complete accident ( as is most of my improv sewing ). I had the colors and was thinking in one direction but not happy with the results. I was playing with log cabins ( shock and surprise) for a different project and realized the tiny centers looked like windows! From that point on I really like the clean lines of the windows and decided to build on the clean lines by creating a city! After a few building I noticed that there were no people ( you cannot have a city with no people)! Thank you Heather Ross for making tiny people for me to fussy cut in so many projects! 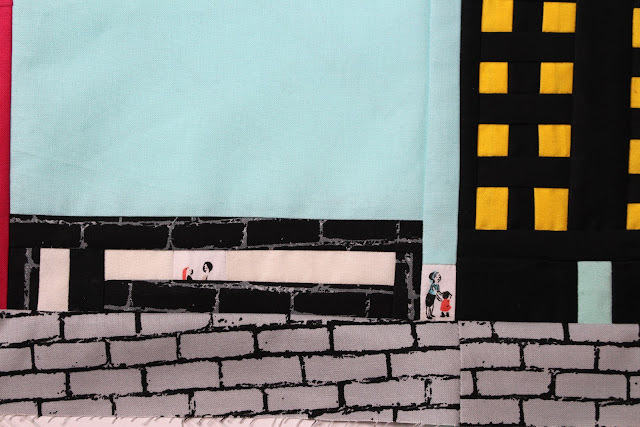 I had also just received fabrics by Luke Haynes for Moda and noticed they were PERFECT for sidewalks and buildings! The lovely group organized the assembly, quilting, binding and shipping of the quilt to California! 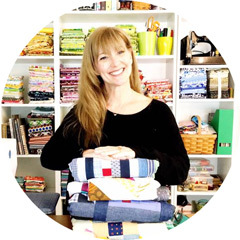 I love the quilting community! I love it! What a great idea to fussy cut the little people! 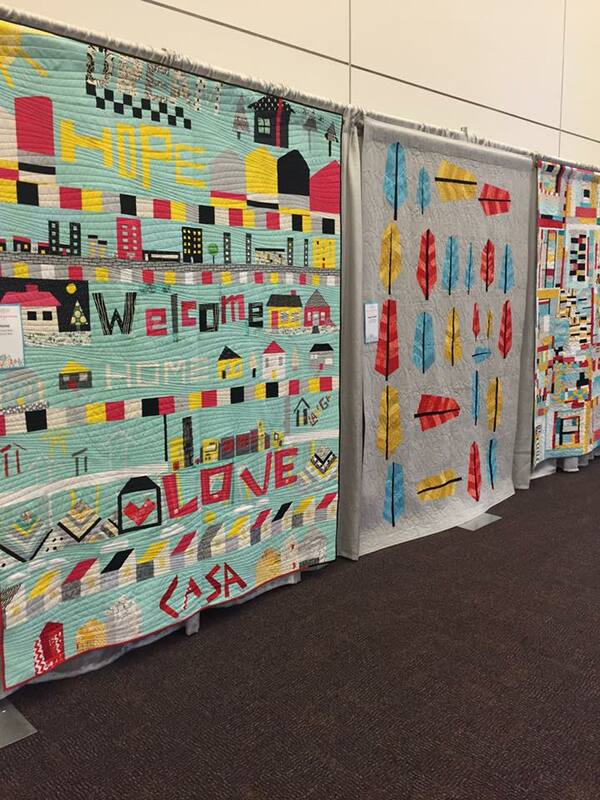 Great writeup on the quilt! That improv row was outside my comfort zone for sure... so glad the MQG is making me "go there"! Great use of fabrics! The whole quilt is very cohesive.